You Can Call Me “Instructor Layne”!!! I’ve mentioned before how much I loooooooove group fitness, and how I was anticipating teaching some classes this year. 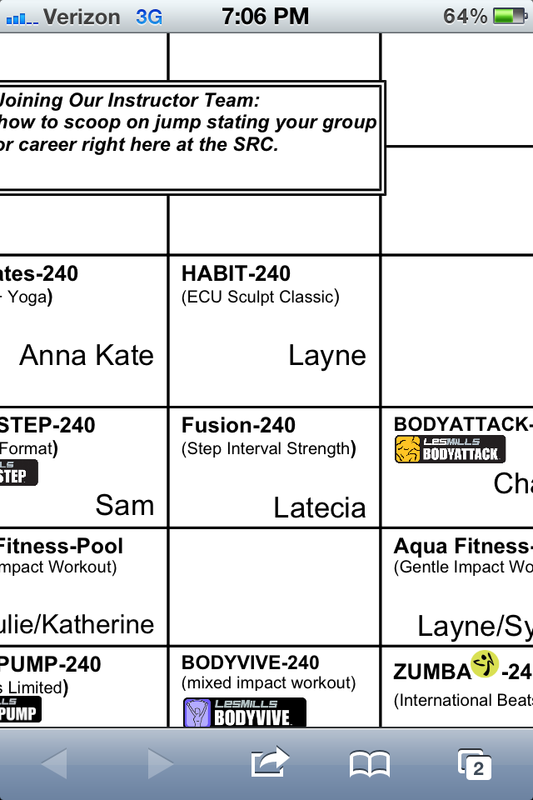 Late last week, my boss e-mailed out the groupfit schedule, and guess whose name was on it… MINE. I almost peed my pants! I choreographed my class last weekend, and that was a little overwhelming. Who knew that fifty minutes could feel so long? I practiced in the exercise studio at the rec center. When I started, there were four other people in the studio. Ten minutes later they had all cleared out… maybe because I kept playing the same cheesey song over and over. But I prefer to think that they were intimidated by my killer moves. I had an instructor choice day with my Lifetime Physical Activity and Fitness class on Tuesday, so I practiced my groupfitness class on them. It went GREAT! They had a BALL! I had a blast too. They got super into the class, and gave me lots of positive feedback. I left class feeling confident about my skills as an instructor. Here is my outfit! And obviously I need to get after my mirror with some heavy duty windex! On a more positive note, I team taught an aquafitness class this evening, and I felt like it went great. The girl I taught with lead the first half of the class, and I lead the second half. This was nice because I was able to be up front withouth the pressure of teaching. When it was my turn to teach it wasn’t such a big deal. The customers seemed to really enjoy my workout, and they all told me afterwards that I did a great job. I really appreciated their compliments because I went into the class feeling pretty down on myself. There were some highs and some lows, but that’s how it is with learning. I’m excited to make some adjustments and teach again. 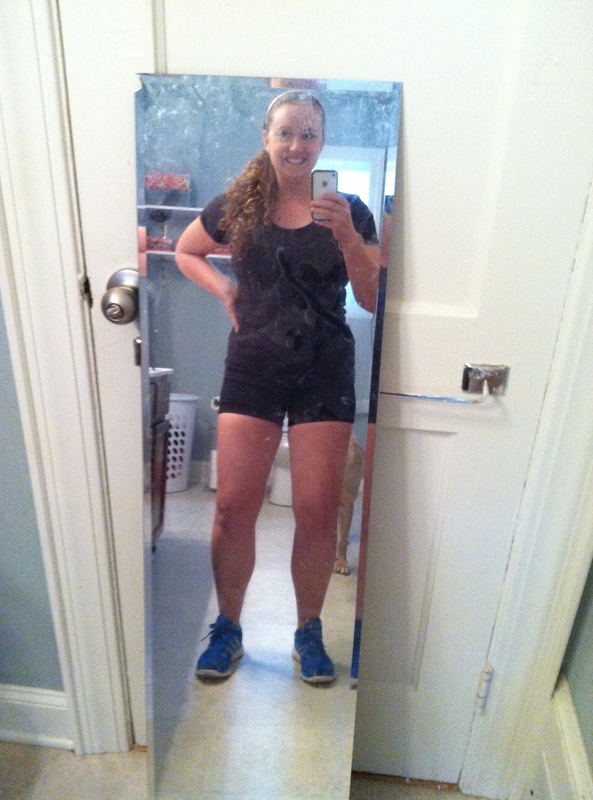 This entry was posted in Group Fitness and tagged AquaFitness, Fitness Instructor, Group Fitness by sparklesandsweat. Bookmark the permalink. You go girl!!!! WOO !!! 🙂 Wish i could take a class again!! Congrats! It’s so exciting to see your name on the schedule for the first time! Just don’t over think when you are teaching – it takes a few classes before you find your groove, and once you do, it’s all about having fun! Good luck! Thanks Sarah! I was disappointed in my first class. I felt like it was boring, but today I had a girl tell me how much she enjoyed it, and that she was coming to my next class (Friday), so that made me feel a LOT better! Oh my gosshhhh it must be so exciting to see your name on that schedule. That’s so great, girl. Don’t be discouraged about your class being bored or not liking it…I know they loved you and everyone has to have their “first” class at some point. You. Are. Awesome. Thanks Kelsey! It is exciting! Teaching is a whole new ballgame!